In Part 1 I explored how Gianni Vio made it into professional football and explored his first season (and a bit) – establishing some of the components that make his set-piece routines so effective. In this piece I delve into the 09/10 and 10/11 seasons at Catania, to further chronicle and explore his routines and to see if his philosophy regarding set-pieces evolves slightly. Some of the same principles that we saw in Part 1 back in play here, 2 players towards the back post take a step out and the ball finds one of them immediately and after a scramble, the ball ends up in the night. My favourite routine over the 2 pieces so far – it’s simply beautiful! Both teams line-up as if it’s a generic free-kick to be lofted into the box. Cagliari put up a one man wall that has 2 players behind it. Upon the kick being taken, one of the players in the main wall runs the opposite direction the Cagliari players are expecting him to run. The 2 players behind the single man wall start their run into the box, whilst the player running short receives the ball. A simple flick over the top to the 2 runners to convert. A flawless routine. Almost a “generic” routine, watch the video above, then watch it again and keep your eye on the goalscorer. He starts closer to the ball than the rest of his team-mates then makes a looping run in front of his marker allowing him to get to the ball first and bury it past the keeper. A clever use of space gets the goal here. 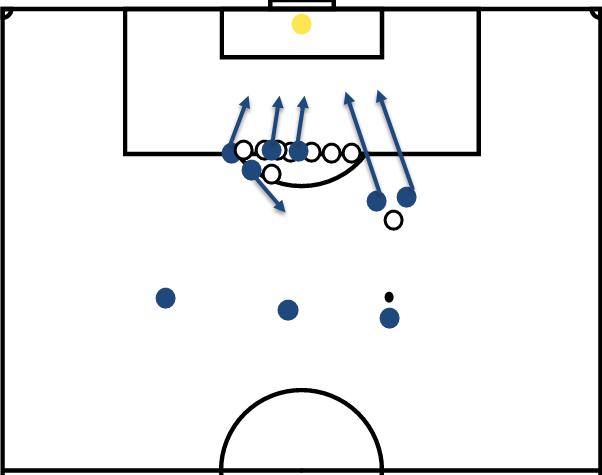 2 players run towards the front post, taking their markers with them – creating space for the goalscorer (labelled 3 in the picture above) to attack that space. Also note the runner attacking the back-post, a classic Vio component. Similar to the above corner, players create space for other players to attack, and it works a treat. The footage is poor but just about able to see what happens. We see a couple of players make runs away from the box, swapping places with runners – confusing the defence giving Catania a vital few seconds that makes the difference. The footage is too poor to make out what exactly happens, but Catania score and it’s from a corner, so it’s here. Just like one of the corners explored earlier, clever runs are the key here. 2 players make towards the near side of the 6-yard box – dragging a majority of the defenders away from the main area. 2 players remain central and we see one of the main components of a Vio set-piece – a runner from deep attacking the back-post. Again footage is too poor for me to do any sort of accurate analysis. Perhaps Vio noticed a weakness in the Roma defence, but this looks a bit unlike most of his other corners. Roma zonal mark the edge of the 6-yard area. Catania packs the back post with 3 players, one of whom manages to head home when the ball is played in towards the far post. An odd one as there’s no classic Vio screen blocking the defenders view, but the chance is converted anyway. The screen returns for this free-kick however, with players peeling off as soon as the kick is taken. Once again it’s effective as the ball flies in. The 09/10 and 10/11 seasons saw Vio carrying on with some of the principles demonstrated in his previous 2 seasons, namely the defensive screen in front of direct free-kicks and runners from deep attacking the back post – most likely due to the ease in which they can lose a marker.